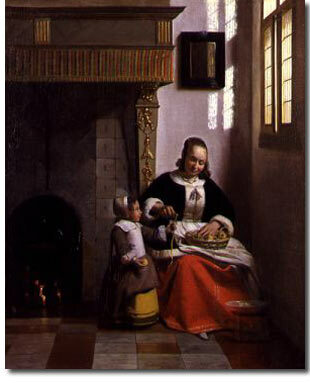 Pieter de Hooch (1630-1677) must be ranked with Maes and Vermeer, because of his successful solution of a problem of his own creation, which no one else has ever solved in such masterful fashion. He aimed to introduce different light effects through open doors and windows, often opposing outdoor and interior light in the same composition. In fact, the only criticism that might be raised against him is that his object is too evident, the difficulties which he overcomes with such striking effect are purposely sought, it savours often of artifice, and his work comes perilously near being a tour-de-force. And yet, with what convincing truth does he not handle the bright glowing of light, the accidental glints and reflectioms, the various actions and interactions of a sun-ray, the warm, luminous ensemble of a series of rooms, the clear, perspective distance - so convincing that, lifting his work above a mere technical triumph, he makes us stand before his pictures amazed. Amazed, because those rooms which he depicts seem to hollow out, the furniture and figures - none so prominent as to distract our attention - are enveloped by that light in such a way that the space becomes deep and receding, it is as if our eyes were fixed to a stereoscope. And that is just the prime quality of all of de Hooch's painting: through light and atmosphere he gives his pictures the illusion of three dimensions. He is equally convincing where he abandons these opposing lights and gives full sway to his glorious sunlight as it bathes house­fronts and courtyards. No one else ever painted sunlight with such brilliancy, such glow, such dazzling effect, such a resplendent stream which transforms and glorifies all. We must also admire the vibrant harmony of his colouring, the unobtrusive placing of his figures, so that the scene always breathes a sentiment of peace, tranquillity, refinement and domesticity. But we will always come back to his unparalleled pictorial expression of the subtleties of sunshine. Where de Hooch learned his jugglery with sun­rays we know not. He is classed as a pupil of Rembrandt, because their light theories are the same in principle, no matter haw diverging in practice. Whether he studied the mysteries of light in Rembrandt's own studio, or at second hand with Fabricius, who first taught him in Delft, cannot be ascertained. For all we know of him is the year of his birth, but not its place, and that from 1655 to 1658 he lived in Delft, where he was inscribed a member of the Guild of St. Luke, we lose sight of him entirely until 1668, when he is found in Amsterdam, where he may have been for ten years previous, far all we know. His last dated picture is of 1677; after that there is absolute silence, from which it may be conjectured that he died shortly after.